This long and grandiose solo piece is shaped like a miniature French grand opera, with big gestures and multiple scene and mood changes. 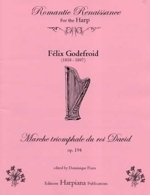 It shows Félix Godefroid, the composer-performer, at the top of his game toward the end of his touring career. Its programmatic content is presented very effectively: you can hear the story unfold with trumpets blaring, horses held to attention and the parade moving toward the temple, climaxing into prayer…. 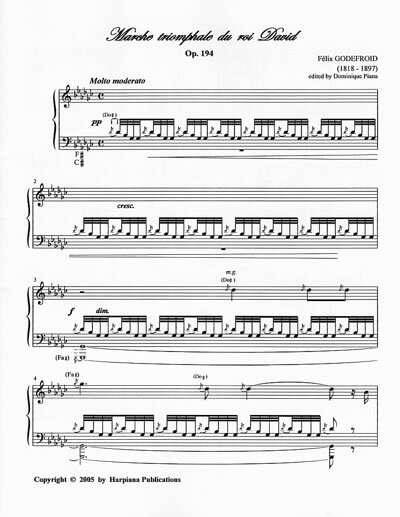 Every effect in Godefroid’s formidable technical arsenal, from the use of synonym notes to harmonics, is used to portray King David in action and build the emotional intensity of the drama.